Onoe and Kaburagi joined the same weekly magazine's staff at the same time, and ever since Onoe has seen Kaburagi as his rival. Kabu's specialty is stake-outs and photography while Onoe is a strict journalist, but despite their different job descriptions, Onoe frets over how Kabu's scoops take precedence over his own stories. He's going to have to figure out how to get over it, though – he's just be transferred to Kaburagi's team, despite his objections. As the two men get to know each other, they're about to learn that it's not so much that the line between love and hate is thin as it's just a full-on paradox when it comes to feelings. Candy Color Paradox is far from Isaku Natsume 's first series from Viz 's SuBLime imprint – previous works include Ginger Honey , Devil's Honey , and False Memories . That means that for some readers, this is already an anticipated release, especially since her stories tend not to be carbon copies of each other. Candy Color Paradox follows a bit more closely in False Memories ' footsteps, being about working adults rather than high school students. The men in this case are both journalists – Onoe is a writer while Kaburagi's focus is more on photography, although there's an implication that he often writes as well. In Onoe's mind, this makes them rivals, but Kaburagi has no such feelings, making their relationship start off as a combination of one-sided rivalry and total irritating. Of course, in the romance genre, that's often a sign of budding true love. Things are further complicated, however, by the fact that some of Onoe's resentment comes from the fact that his ex-girlfriend dumped him for Kaburagi, which makes him even less inclined to give the other man anything resembling a fair shake. What truly sticks in his craw, however, is that he sees Kabu as being a much less ethical journalist than he himself is. Onoe sticks to the facts of a case, putting in the research and not writing up the story unless he has done all he can to ensure that his story is as factual as possible. He'd never dream of doing something like building a network of informants by bartering sexual favors for information, and when he finds out that Kaburagi has done just that, he's aghast, if not slightly disgusted. It certainly raises questions about the whole ex-girlfriend thing as well, even if paranoia isn't necessarily one of Onoe's issues. To get things to change to the point where we can reasonably see these characters falling in love, Natsume has to make sure that we understand that Kaburagi has nothing against Onoe specifically (apart from finding him kind of annoying) and that Onoe eventually comes to understand that Kabu is just doing his job as best he can with the tools he has available to him. In the case of the former, Kaburagi has to realize that Onoe's criticisms are largely coming from the fact that he's a straight-laced guy who hasn't been tainted by the horrible things he's uncovered in writing about the news. Kabu has definitely allowed himself to become jaded and perhaps a little warped by everything he's learned, and he admires that Onoe hasn't. One job the two work on together involves uncovering a rigging scandal involving an actress who has won multiple awards; even when they find out that the rumors were true, Onoe still feels badly about revealing the truth (although he never even considers not doing so) – he's worried about the actress' many fans and how upset they'll be. While it isn't always obvious that this is how his mind works, it is indicative of the way Onoe approaches his reporting: adherence to the facts and with a degree of compassion no matter how awful the story. Kabu had this beaten out of him by the corruption he's reported on, and he likes that Onoe retains his innocence. This may be a factor in why he eventually falls for Onoe, although he himself isn't sure of his own emotions, at least not entirely. Certainly we can see him as harboring distaste for the girlfriend who essentially used Kaburagi as an excuse; in his mind, a woman who would do that isn't good enough for someone as innocent as Onoe. Onoe's own emotional entanglement with Kaburagi is a bit less clear, although we can see him developing an admiration for the other man's work ethic and skill at what he does. He's also clearly working towards an obsession with him, which his bar owner friend points out as being a crush. Even when things get sexual, it isn't necessarily obvious that Onoe fully accepts whatever feelings he has for Kaburagi (much to Kaburagi's frustration), but in a multi-volume story, we do want there to be room for development. In terms of explicitness, this is on the low end, with nothing remotely racy until basically the end of the book and that more implied than drawn. Natsume's art is pleasant to look at, and her characters easy to tell apart and both more masculine than not. There isn't much in the way of backgrounds, but characters aren't just floating in space either. 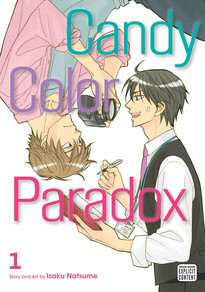 On the whole, Candy Color Paradox 's first volume is an enjoyable story, not perfect by any means with Onoe firmly coming down more on the side of “annoying” and some plot elements given short shrift, but if you're a fan of the lighter side of BL , this is worth a look.